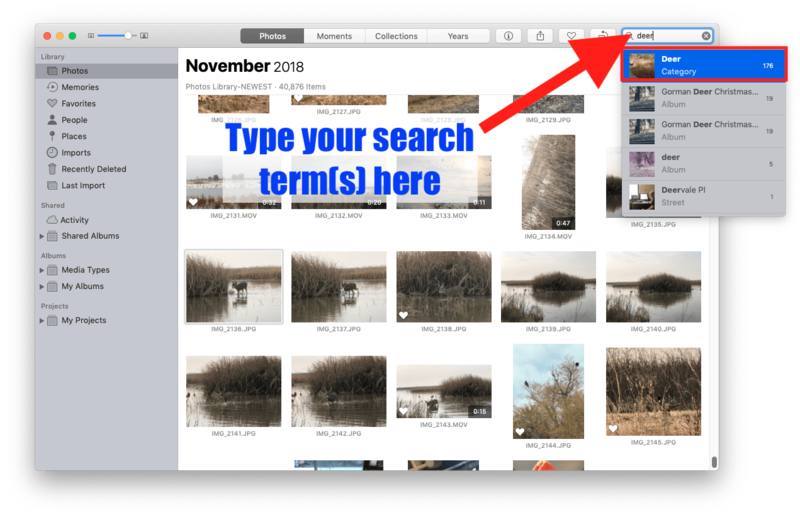 The Photos app has a really good search feature. It’s ridiculously easy to use, with almost magical results. You should try it. Get into Thumbnail mode in Photos. Photos will show you a menu (attached to the Search box) with various things: pictures whose category match what you searched for, pictures whose album matches what you searched for, pictures whose location matches what you searched for, and so on. 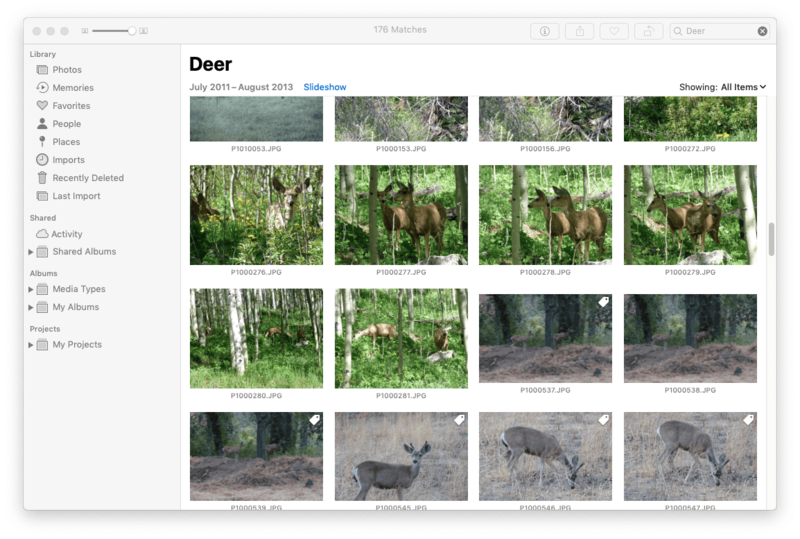 Note: the Photos app figured out which images had deer in them, automatically. I didn’t have to do anything other than search. I didn’t have to categorize my photos, or tag them, or put them into albums, or name them, or anything. Photos figured it out by itself: I have 176 pictures with deer in them. On occasion, Photos makes a mistake. 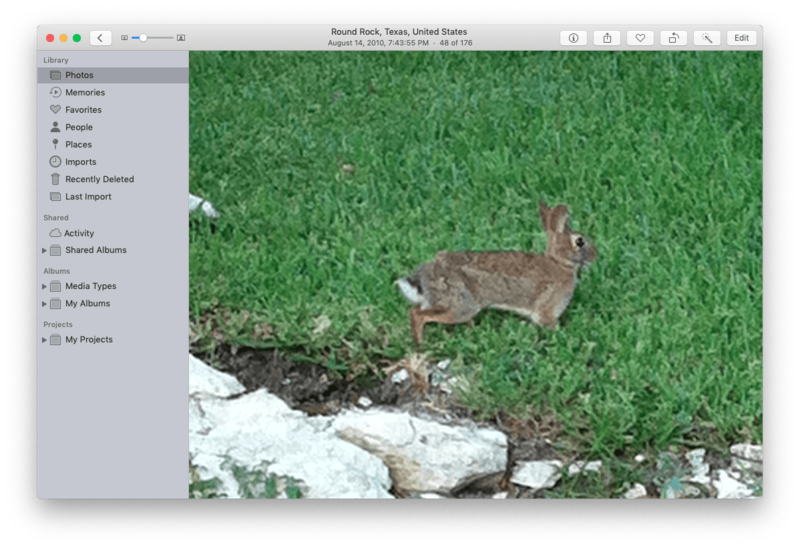 Here’s a picture of a rabbit– Photos thought it was a deer. Note: if you try the same kind of search on your iPhone you might find the results don’t match the ones from your Mac. This is because Apple thinks it’s best for the categorization to be performed on each device rather than having iCloud analyze your photos as they reside on Apple’s servers. This is a privacy choice by Apple, which is nice, but on occasion it results in one or two more photos being found within a category on either your phone or your Mac.